(Los Angeles Times) For all the cheers that came with the end of the teachers’ strike, it’s become clear that some of the Los Angeles Unified School District’s greatest woes could not be tackled at the bargaining table. The nation’s second-largest school system remains beset by declining student enrollment, lagging academic achievement and serious financial problems — and privately operated charter schools still pose an existential challenge as they compete for students. L.A. Unified, which has about 485,000 students, has been losing about 12,000 a year because of population trends and charter schools. Students translate to funding. The school system also faces a growing financial strain because of rising contributions to state-run pension funds and retiree health benefits. The pension drain is hurting state school systems, said Elisha Smith Arrillaga, co-executive director of the nonprofit advocacy group Education Trust-West. (American Prospect) For years, many labor experts seemed ready to write the obituary of strikes in America. In 2017, the number of major strikes—those involving more than 1,000 workers—dwindled to just seven in the private sector. Indeed, over the past decade, there were just 13 major strikes a year on average. That’s less than one-sixth the average annual number in the 1980s (83), and less than one-twentieth the yearly average in the 1970s (288).In 1971 alone, 2.5 million private-sector workers went on strike, according to the Bureau of Labor Statistics—that’s 100 times the number, 25,000, who went on strike in 2017. But then came 2018 and a startling surge of strikes in both the private and public sectors. More than 20,000 teachers and other school employees walked out in West Virginia in February, followed by at least 20,000 more in Oklahoma. Probably the biggest educators’ strike came in Arizona, where more than 40,000 walked out. There were smaller, but still large, teacher walkouts in Colorado, Kentucky, and North Carolina. This past September, 6,000 hotel workers went on strike against 26 Chicago hotels to demand year-round health coverage for all hotel workers. In October, 7,700 workers struck 23 Marriott hotels in eight cities, including Boston, Detroit, Honolulu, and San Francisco. In November, 15,000 patient-care workers, including radiology technicians, respiratory therapists, and pharmacy workers, held a three-day strike against the University of California’s medical centers in Los Angeles, San Francisco, San Diego, Irvine, and Davis. An additional 24,000 union members, including truck drivers, gardeners, and cooks, struck in sympathy. And in one of the most startling work stoppages of all, an estimated 20,000 Google workers walked out on November 1 to protest how the company handled sexual harassment accusations against top managers. “That was remarkable,” says labor historian Nelson Lichtenstein, pleased to see that even the elite workers at one of the world’s more prominent tech companies recognize the effectiveness of collective worker action. Rebecca Garelli (left), an organizer of the Arizona teachers' strike, says that anger about Donald Trump and Betsy DeVos "fired up a lot of people." (The American Prospect) California growers have complained of a tight labor market for years. And President Trump’s dispatch of military units to the border, along with a decade of deportations, have tightened that market even more by restricting the flow of migrants into the fields. This recipe for confrontation has produced an escalating legal battle in Washington, D.C., and a walkout by hundreds of tangerine pickers in the Central Valley. Growers have increasingly turned to H-2A visas for guest workers as a remedy, with the decade ending in 2018 seeing a more than 370 percent increase, with no decline in sight. Although some growers have signed union contracts and provided better wages and benefits in order to attract a stable workforce, others are not happy with the federally mandated pay rates for guest workers—and are actively seeking to hold wages down. The National Council of Agricultural Employers, a growers’ lobby, filed suit this month against the U.S. Department of Labor to freeze the wages of H-2A workers at a level barely above the minimum wage. Growers recruit guest workers every year from other countries, mainly Mexico. They're given visas for less than a year, requiring them to work for the employer who contracts them. They must leave the country when their work is done. Growers have to advertise for local workers first, and can only bring in guest workers if no local workers are available. Central Valley farm workers organize in McFarland. Interesting how stories on labor and strikes are now mostly about education policy. (Our Future) The emergence of charter schools as an important consideration in teacher collective bargaining agreements, and the recognition of charters as a form of privatization, are two major developments in the education policy and politics of choice. Republican lawmakers held a press conference on Capitol Hill to kick off National School Choice Week, an annual event that began in 2011 under President Obama who proclaimed it as a time to “recognize the role public charter schools play in providing America’s daughters and sons with a chance to reach their fullest potential.” This year, Democratic lawmakers took a pass on the celebration. You can thank striking teachers for that. In the latest teacher strike in Los Angeles, the nation’s second-largest school system, some 30,000 teachers walked off the job saying unchecked growth of charter schools and charters’ lack of transparency and accountability have become an unsustainable drain on the public system’s financials. DENVER (Courthouse News) – Teachers showered a new compensation proposal presented by Denver public schools Superintendant Susana Cordova Thursday night with boos, jeers of “shame,” and Twisted Sister song lyrics. The district’s new proposal would add $3 million to teachers’ salary pot beginning in 2021, as well as an increase in cost-of-living adjustment and a promise to reinvest turnover salaries back into wages for new hires. The district is offering to budget $51.5 million for teacher salary, but the union which voted to strike last week remained unswayed. Despite more than a year of negotiations, an $8.5 million gap remains between the teachers’ requested pay and the district’s offer. The district offered an average 10 percent raise per teacher, but the union is holding out for 12.5 percent pay raises that are less reliant on bonuses. ProComp, their compensation agreement, expired on March 14, 2018, but was extended through Jan. 18 pending negotiations. (Common Dreams) Building on rising public support for scrapping the nation's for-profit healthcare system and replacing it with Medicare for All, the nation's largest nurses union—along with progressive allies—on Saturday will kick off a week of barnstorms in cities and communities across the United States. Volunteers nationwide, coordinated by National Nurses United (NNU), are planning more than 150 events from Feb. 9 to Feb. 13. 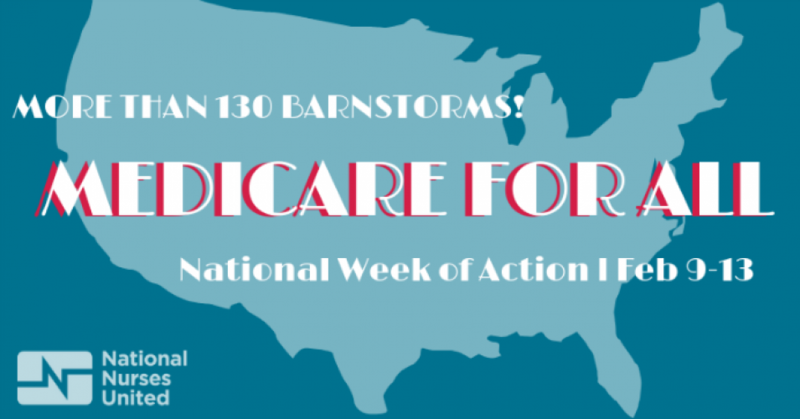 As NNU executive director Bonnie Castillo explained, "The barnstorms are about harnessing that momentum and continuing to build it out even further, into every community, conversation by conversation, neighbor by neighbor—until the people's will for Medicare for All becomes the political will to get it done." At the events, according to organizers, "you'll gather with volunteers near you, talk about the plan to win, and begin organizing to knock doors, make phone calls, and more in your community." Find an event in your community here. DENVER (Courthouse News) – Denver’s school district and its teachers’ union agreed to the terms of a new compensation contract early Thursday morning, bringing a three-day strike to an end.